If you are on an Express, Deluxe, or Ultimate Website Security plan, we provide HTTPS support to your website as part of your Web Access Firewall (WAF). You can also use a custom certificate (EV, OV, or Wildcard) in addition to the one provided with just a few simple steps. Provide a copy of your private key (.key) and certificate (.crt) files. 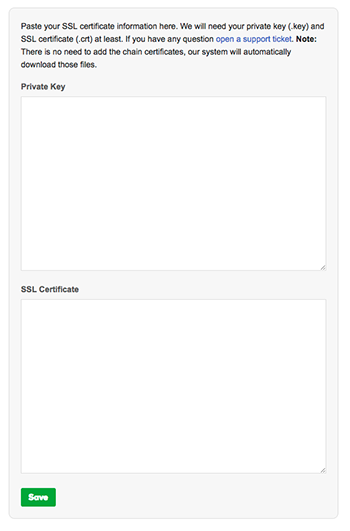 It can take up to 10 minutes after saving your certificate for the SSL to activate on the WAF.